The biopic based on Bollywood actor Sanjay Dutt, ‘Sanju’, threw a lot of light on his personal life. The film was based on his life in jail and the consequences that lead to it. The audience and fans wanted to know more about his personal life, however, they couldn’t. Hence, for the uninitiated, Sanjay Dutt is presently married to Maanayata Dutt and has two children- Iqra and Shahraan. He also has a daughter, Trishala Dutt, from his first wife, Richa Sharma. Sanjay Dutt shares a beautiful bond with both of his daughters Iqra and Trishala. For any father in the world, daughters are special. Likewise, his daughters are special to him. Unfortunately, Sanjay Dutt has caught the attention of netizens for the wrong reason on the Internet. It was National Girl Child Day on January 24 and the dotting daddy took to Instagram and posted a beautiful picture with his second daughter, Iqra. Sanjay Dutt’s wife Maanayata too, commented on the picture, revealing his favourite person in the family is Iqra. 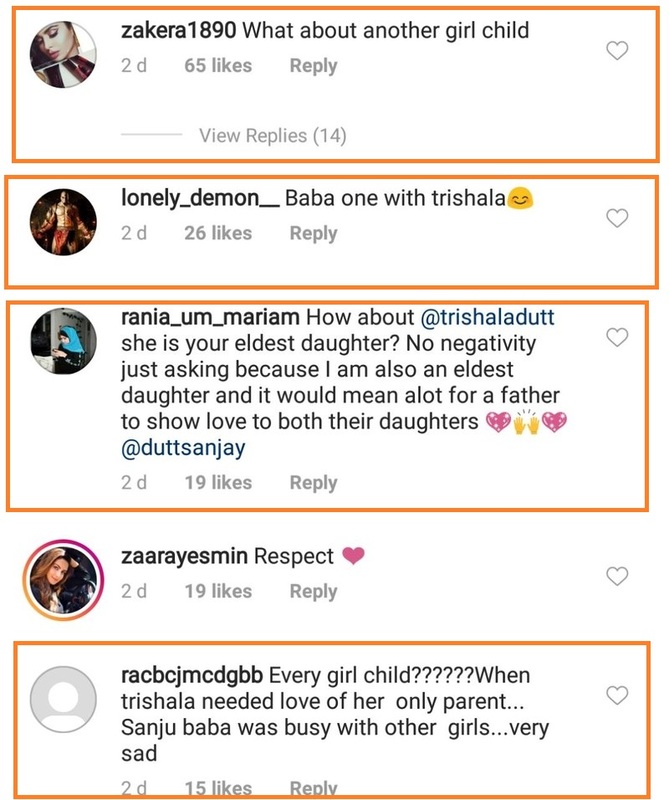 What caught netizen’s eyes was Dutt posted a picture only with Iqra and there wasn’t any other post wishing Trishala on the occasion. 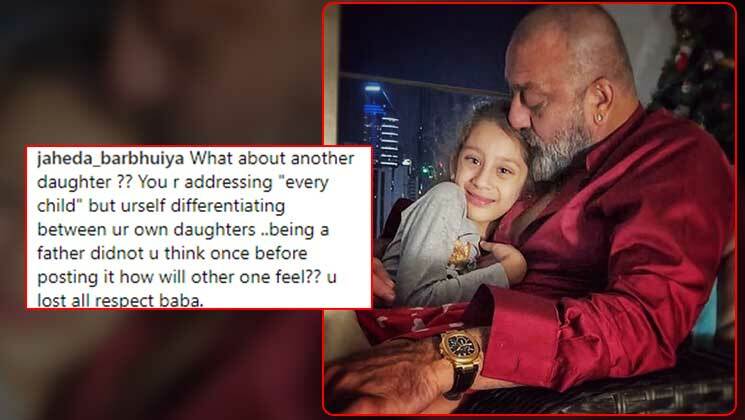 Netizens commented on the post reminding Sanjay Dutt that he has one more daughter and accused him of discriminating between his two daughters. The actor was also brutally trolled for not wishing Trishala. 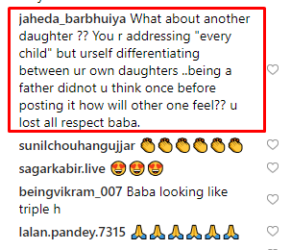 It is to be noted that Sanjay Dutt and Trishala Dutt are often seen commenting on each other’s post. On Trishala’s 30th birthday, the star’s wife had wished Trishala with a heartwarming message. Trishala Dutt sharing a heartwarming pic with her dad Sanjay Dutt. On the work front, Sanjay Dutt will be seen in the upcoming multi-starrer film ‘Kalank’, one of the most highly anticipated releases of 2019. The film also features Alia Bhatt, Sonakshi Sinha, Varun Dhawan, Madhuri Dixit-Nene and Aditya Roy Kapur. Abhishek Varman is directing the epic drama.